How to get comfort from Thoracic Outlet Syndrome (Neck Tingling)? The space at the thoracic outlet or inlet when it is less than adequate, subjects the neurovascular structures seeking to gain entry into the upper limbs via this space, to undue pressure. The blame for the neurovascular complaints should be placed at the doorstep of the decreased space and not at the structures producing the problems. This syndrome results from the compression of neurovascular bundle comprising of subclavian artery and vein, axillary artery and vein and brachial plexus at the thoracic outlet. Thoracic outlet is a space between the first rib, clavicle, and the scalene muscles. The sites of compression could be either Supraclavicular, Subclavicular or Infraclavicular. Supraclavicular: Interscalene triangle between the anterior scalene muscles. Subclavicular: Interval between the second thoracic rib, clavicle, and subclavius. Infraclavicular: Beneath an enclosure formed by the coracoid process, pectoralis minor, and costocoracoid membrane. Scissor-like encirclement of axillary artery by the median nerve. Arm when in full abduction pulls up the artery by 180 degree causing compression in the short retroclavicular space. Vigorous occupation: Increases the muscle bulk and thereby decreases the space. Inactive occupation: Decreases the muscle bulk and thereby increases the space. Congenital: Cervical rib decreases the interscalene space and thereby decreases the retroclavicular space. Traumatic: Malunion or nonunion of fracture clavicle. Anomalies of the first thoracic rib. Tumor arising from the upper lobe of the lung. 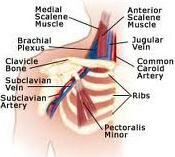 Abnormal variations of the scalene muscles. Obviously, this syndrome poses two major problems. The first one relates to the compression of the major vessels and secondly to the compression of the nerves. Here the compression could be arterial or venous. During the arterial compression, which is mild in the early stages the patient complains of numbness of the whole arm with rapid fatigue during overhead exercises. If the compression is significant, the patient will complain of cold, cyanosis, pallor, and Raynaud’s phenomenon. Venous compression leaves the limb swollen and discolored after exercises, which disappears slowly with rest. Patients complain of par esthesia along the medial aspect of the arm, hand, little and ring fingers. There is weakness of the hand also. X-ray Neck: To rule out intrinsic causes like cervical spondylosis, cervical rib, etc. Nerve Conduction Studies: Difficult to determine the nerve conduction velocity through the thoracic outlet, but its biggest value is to rule-out problems like entrapment, e.g. ulnar nerve at elbow, wrist, etc. Conservative treatment: Consists of rest, physiotherapy, exercises like shoulder shrugging, etc. How we treat Fracture of Femur? Supracondylar region extends from the femoral condyles to the junction of metaphysis with femoral shaft .The distal fragment is displaced and angulated posteriorly due to the pull of gastrocnemius muscle. It is due to severe valgus or varus forces with axial loading and rotation due to RTA, fall, etc. Each is further subdivided into 1-3 depending on the severity of comminution. Type B: Partial articular (Unicondylar). Type C: Total articular (Bicondylar). Articular simple and metaphyseal comminution. It consists of the usual features of fractures, but what is specific to this fracture is the flexion deformity caused by the pull of gastrocnemius. Hemarthrosis is commonly seen, especially with fractures extending into the joint. Radiograph helps to study the fracture pattern more accurately. Routine AP, lateral and oblique (45degree) views are required. Arteriography: This should be performed in suspected vascular damage or in associated dislocation of the knee joint. The treatment usually consists of conservative methods, traction and operative methods. Conservative Methods: This has a limited role and is usually useful in impacted and undisplaced fractures. In the former, a long leg or Spica cast is sufficient and in the latter, a long above knee cast after an initial period of skin or skeletal traction is all that is required. Traction Methods: The choice is mainly skeletal traction and two methods are described. Upper Tibial Traction: Here the skeletal traction is applied through the upper end of tibia. Initial weight used is around 15-20 lbs and is subsequently reduced. The traction is given for a period of 8-12 weeks and the patient is put on cast braces. To prevent the knee stiffness from developing, the patient is encouraged to carry out the knee movements during the traction itself. Two-Pin Traction Method: In this method, traction is added through the distal femur apart from the traction given through the upper end of tibia. 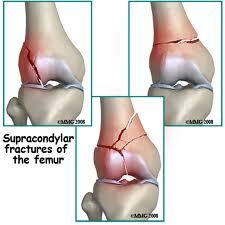 This helps in accurate reduction of the fracture and maintains the reduction so obtained. The disadvantage of this technique is that it is cumbersome and may cause neurovascular compressions in and around the knee. Operative Methods: This consists of DRIP and is preferred as the closed reduction is associated with troublesome complications like limited knee motion, residual varus and internal rotation deformities. The advantages of open reduction are early mobilization of the knee joint and an accurate reduction and rigid fixation. Fixation Methods: The choice is between medullary fixation and blade plate fixation. Intramedullary Fixations: Rush pins, Ender’s nail, medullary nails, split nails, static locking nails, etc. are some of the commonly used medullary fixation methods. They offer biological fixation but the fixation offered is less stable. Trigen (Third generation) Knee Nail: Inserted in a retrograde fashion. It is a titanium nail and has two holes for oblique screws and one for transverse screw at the insertion end. At the opposite locking end two holes are present in the anteroposterior plane and 2 holes in the lateral plane. The results are encouraging. The complications commonly encountered in supracondylar fractures are delayed union, mal union, nonunion, injury to the popliteal vessels and common peroneal nerves, knee stiffness, deep vein thrombosis, infection, implant failure, etc. How to Care for Muscle Injury Pain? Injury to the muscle and tendons is called strain. Sudden unaccustomed or abrupt action or movements may tear the muscles. Direct trauma can also injure the muscles and tendons. Overstretching of muscles due to indirect trauma, especially in sports persons. Acute Strain: This is due to sudden violent force or direct trauma. Chronic Strain: This is due to injury existing since a long period leading to muscle ischemia and fibrosis. Injury to the muscles leads to pain. As a result, the muscle goes into spasm to limit the movements and reduce pain. Nevertheless, paradoxically, this protective muscle spasm causes pain due to stimulation of pain fibers and thus a vicious cycle sets. The painful stimuli cause muscle spasm through the peripheral nociceptive stimuli. This is due to blunt injury and is due to direct trauma of lose intensity. Pathology: Few muscle fibers torn. Bleeding is minimal and the fascia remains intact. Pain and spasm prevents muscle stretching. Function is not impaired largely. Tenderness over the affected muscles. First aid is by Cryotherapy (by application of ice) for a period of 20 minutes. Gentle active muscle stretch may be permitted after 20 to 60 minutes. Compression bandaging with optimum pressure. Low dose and low power ultrasound helps. Gentle massaging of the surrounding area helps. If pain is minimal, the patient can be allowed to do the light work the next day. Cause: Here the trauma is more serious. Greater number of muscle fibers is torn. The fascia is still intact. Symptoms: Here are the symptoms. The patient is unable to move the limb. Cause: Undoubtedly, these injuries are due to trauma of a greater magnitude. Pathology: Larger area and greater number of muscle fibers are involved. More than one muscle group may be involved. The fascia is partially torn. Bleeding is widespread and more. There could be both intramuscular and inter muscular bleeding. The patient experiences severe pain and loss of function. Symptoms: Here all the above symptoms are of greater intensity. Isometrics to the muscles, which are immobilized. Active exercises to the unaffected joints. Pulsed electromagnetic field therapy (PEMF) is known to help. No active movements to the affected muscles. The pressure bandage is removed and active muscle exercises are begun. Stretching within the limits of pain is commenced. Thermotherapy: Ultrasound, short wave diathermy and TENS help to relieve pain. Rest of the measures is the same as above. More vigorous active movements are encouraged. Deep transverse friction massage is added. Partial weight bearing can be permitted. All the above measures are pursued in a more vigorous manner. Pressure bandage is totally removed. Progressive resisted exercises using the Fowler technique by taking out 10 to 12 repetition maximum (RM), is practiced. Full weight bearing should be permitted in injuries of the lower limbs. After full movement is regained, the patient is allowed to walk and jog. Full functional activity should be regained by 4 to 6 weeks. The various drugs used in the treatment of muscle strain to relieve pain and muscle stiffness is depicted. Cause: This is usually caused by severe trauma. Complete tear of the muscle. Considerable bleeding which is intramuscular and diffuse. A snapping sound may be heard by the patient. Palpable gap between the muscles felt. Active movements produced by the agonist are absent. Active muscle contraction is absent. Joint function is not lost. Muscle spasm is very severe. Surgery is advised. This involves opening the ruptured site, evacuating the hematoma and suturing the fascia sheath. Direct muscle repair is avoided. Compression bandage is applied and the limb is immobilized for 2 to 3 weeks. Slow rhythmic isometric exercises to the affected muscles. Non-weight bearing after 48 hours. The use of low frequency current (faradism) to obtain passive contraction is very useful. Deep heating modalities like ultrasound, etc. help. Rest of the measures is same as for Grade II / III injuries.